ezCloud is a SaaS startup offering property management and channel management products for the hospitality industry. 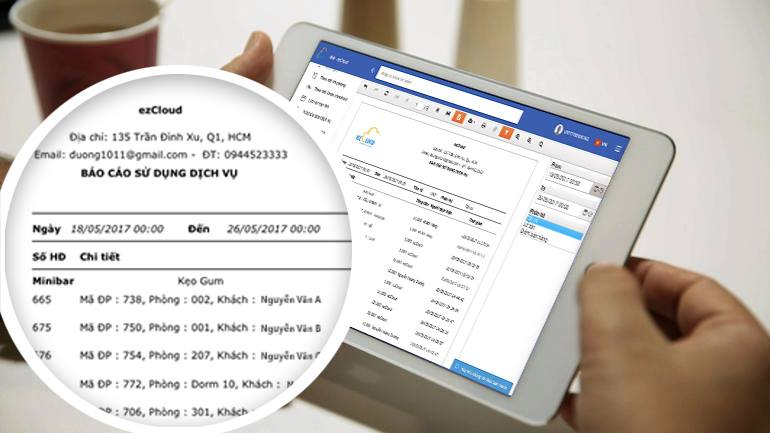 Started in 2013 with corporate IT solutions, ezCloud released the first SaaS product for medium-small hotels in 2016 and needed brand new sales and marketing processes to bring the product to market. Fast Forward Advisors supported ezCloud to design and execute a new growth model for the cloud solutions, allowing the company to dramatically increase sign ups while reducing the customer acquisition costs. 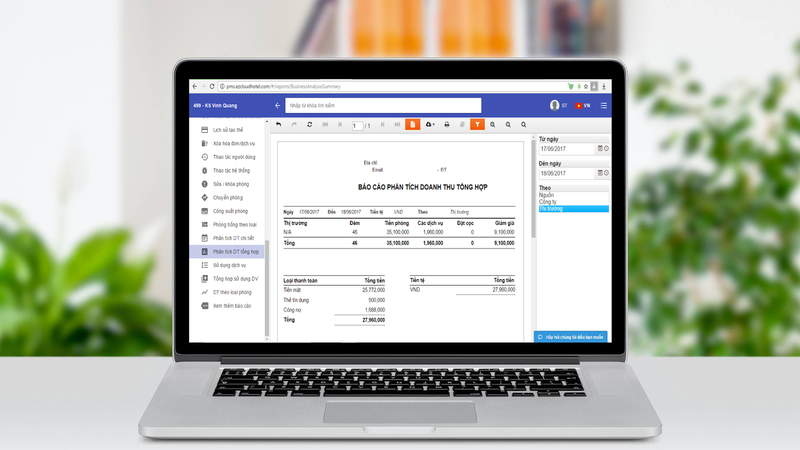 ezCloud is a SaaS startup a suite of management products for the hospitality industry: ezFolio (4-5* Hotel management software) ezCloudhotel (Cloud-based hotel management software), ezCMS (Cloud-based channel management system). Prior to FFA’s support, ezCloud has ran several digital marketing campaigns besides traditional marketing activities to distribute their products to the target audience, which are hoteliers and decision makers in hotels. However, at that time, ezCloud only relied on calculating performance on overall number of signups from the website and had nearly no insights about how each of their campaigns across the whole funnel were performing. It’s always useful for you to test out all possible channels to find out what is the best source for getting conversion to put your money and effort into. With our help, ezCloud was able to define several different strategies, channels and tactics: SEM (Google Adwords, and specific local SEA search engines), SMM (Facebook), Email, Forum seeding, etc. Given the number of channels that ezCloud is doing their marketing activities on, the demand for a tracking system is inevitable to help ezCloud monitor simple yet important elements for their activities. As a result of that, FFA supported ezCloud in setting up Google Analytics accounts to keep track of website-related data, implementing Google Adwords remarketing code and Facebook pixel using Google Tag Manager for the purpose of doing remarketing, applying UTM parameters with predefined naming convention and setting up UTM tracking system to receive session-based information for every signup on their websites. Besides that, ezCloud also received our support in creating a dashboard and helping them to integrate those new changes in the CRM system so they could track customer conversion along the sales process. FFA walked ezCloud through the process of choosing the metrics that mattered the most to them, how ezCloud could keep track of these metrics based on the data extracted from the tracking system as well as provided weekly reports on running campaigns performances., We helped ezCloud to calculate CLTV for each customer segment allowing them to have a clear vision of how much a customer is worth and correctly allocate to marketing budgets / CAC limits to acquire a new customer. Review results of campaigns and adjust targeting and budgets accordingly. This, as an example, translated into optimizing the keywords list for Adwords campaign and facebook audiences in order to help ezCloud efficiently reach their target audience within an optimized budget. We explored the user / customer experience and journey on the ezCloud’s websites and reviewed these on other global competitors’ website, in order to identify what elements made people drop off from certain pages and what could be improved to boost sign ups and to reduce churn and bounces. time, ezCloud only relied on calculating performance on overall number of signups from the website and had nearly no insights about how each of their campaigns across the whole funnel were performing. ezCloud is a SaaS startup a suite of management products for the hospitality industry. 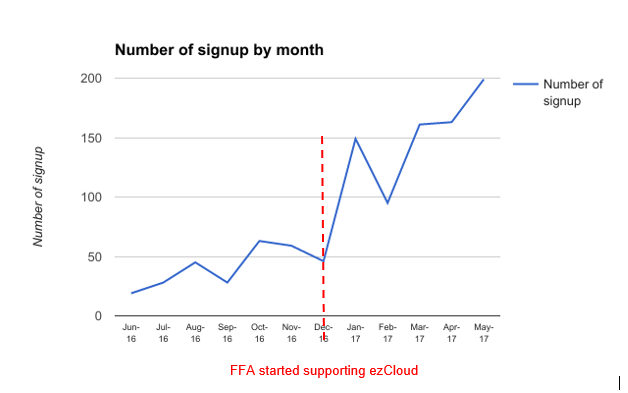 The graph above shows the change in number of signups in each month before FFA got on board to help ezCloud (starting from Dec-16) and after. We achieved to reach an approximately 300% increase of signups from qualified leads, increasing and expanding the reach within the target markets. 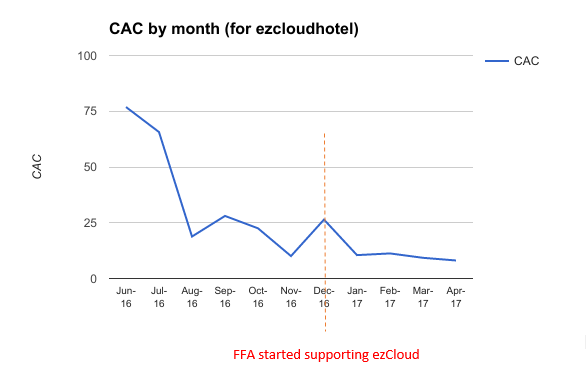 As can be seen from the graph above, the CAC has gradually dropped since FFA started supporting ezCloud with their marketing activities. ezCloud has been able to cut down the cost to acquire a new user by 64% and keep it stable ever since. Our support was provided remotely by working with responsible personnel at ezCloud via Skype and on shared folders which enabled everyone to work together at the same time and keep track of all the works in progress. Once a week, there was a physical meeting where FFA and ezCloud sit down together to review weekly performance of all campaigns and decide what should be done next following their marketing strategy.